How to edit a course in the "teaching" tab ? 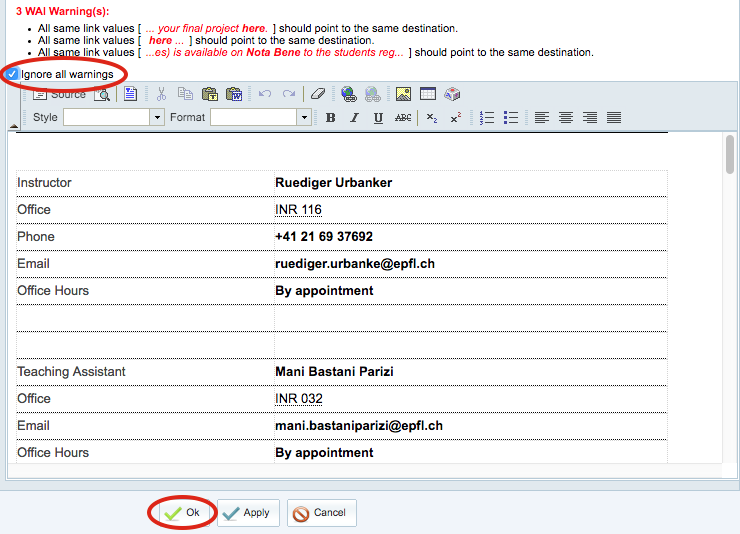 How to upload documents on my.epfl ? How to add documents to your course ? A window will pop up, and you can edit the course using either the previsualization window, or the html code by clicking on the “Source” button. When you have finished, click “Ok” to close the window. If warnings appears, have a look at them, but sometimes there are not important and you can simply check the “ignore all warnings” box and click “Ok” again. To make the changes appear online, you have to click the “Publish” button on the blue bar, on the top of the window. 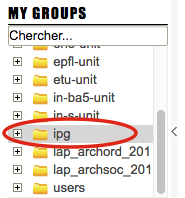 Look for the folder “IPG” located in the left panel called “My groups”. If you can’t find it, you may not have access to it yet. If you are a member of IPG ask mike.bardet@epfl.ch to obtain access. 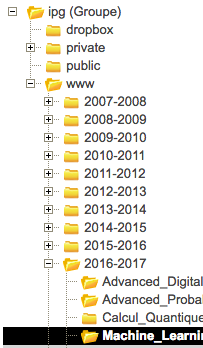 Click on “www”, then click on the year corresponding to your course, and finally click on the folder corresponding to your course. You can create those folders if necessary. Click on “Déposer un fichier” to upload a file. If you have lots of documents to upload, refer to the second method for a quicker way to do that. To massively upload documents, it’s better to connect directly to the server of my.epfl. This procedure is OS specific and is described here. 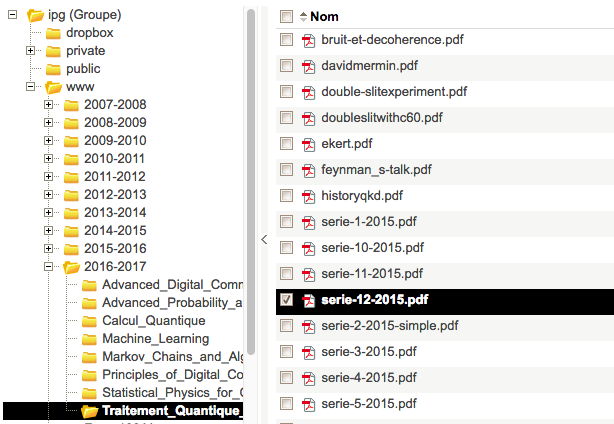 Make sure you have already uploaded your documents on my.epfl.ch or any other file server. Information about this procedure can be found in the previous tutorial. Go to my.epfl.ch, on the group IPG located in “My groups”, click on “www”, click on the year corresponding to your course, click on your course, and finally select the document you want to add to your course. Copy the url on the right panel. 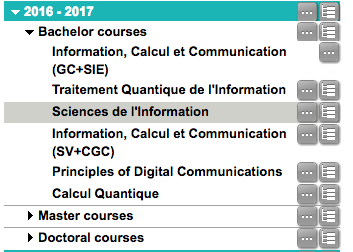 Go to ipg.epfl.ch to edit your course. In the edition window, write the name of the file, e.g. “homework1.pdf”, highlight the name, and then click the “insert/edit link”. A window will pop up, paste the link in the “URL” box and click “Ok”.